Archangel Michael is one of the most popular and widely known archangels, this is largely due to the fact that he is one of seven archangels in the Hebrew tradition and he is the only archangel mentioned by name in the Bible. Archangel Michael is also referenced by name in the Torah, and the Qur'an as a protector against evil, and a warrior of God! But you don't have to be religious to call upon this powerful Archangel of protection, love, and light. Actually, Archangel Michael is also one of the easiest Archangels to hear and connect with, as his purpose revolves around helping humanity directly. He also connects through the Sun and is one of the closest archangels to us in the physical realm. He also connects through the Sun and is one of the closest archangels to us in the physical realm. Michael is also the easiest to begin hearing as he oversees the psychic gift of clairaudience or psychic hearing. Archangel Michael is deeply committed to helping humanity grow and increase in vibration, and is a wonderful ally for protection, releasing fear and so much more! Archangel Michael oversees guardian angels, and can help you to release lower energies of fear or worry so that you can open to experience the incredible love and light of the Angelic Realm. If you are wanting to connect with Archangel Michael, all you need to do is invite him to connect with you and support you in your life experience. He can help out in so many areas and seeks to help you live a fun, fulfilling and passionate life. Archangels are not limited by time and space and so they have the ability to connect with all who call upon them at the same time. If you ever find yourself in fear, worry or doubt simply call upon Michael and with his sword of light he will cut away the fearful attachments which bind you. Are you ready to connect directly with the realm of the angels? 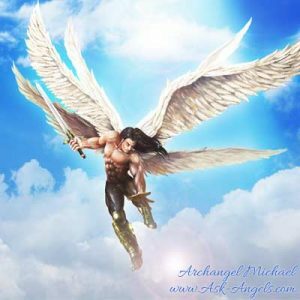 I've also written and recorded a much more in-depth prayer you can use to invoke Archangel Michael, which has proven to be helpful for many people. There aren't rules about when you can and cannot call on Archangel Michael. That being said, Archangel Michael is a great angel to call upon if you are needing to release negativity cleanse your home or office, or to simply connect with the courage needed to make positive life changes. 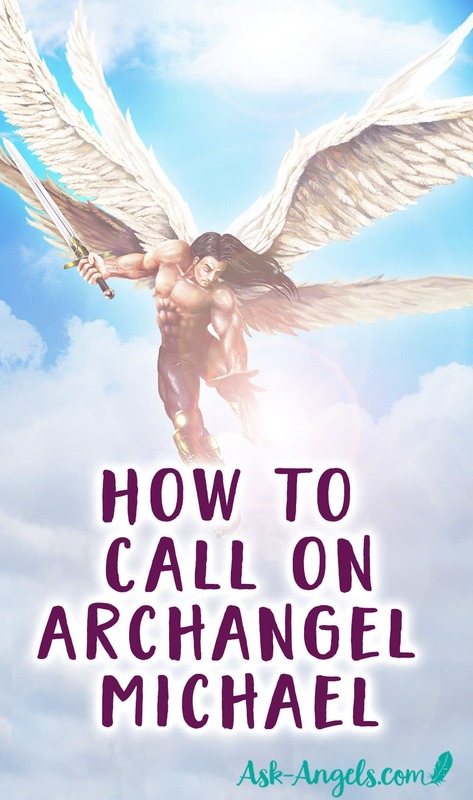 There is no task too big or small for angels, so never think that you are wasting Archangel Michael's time by calling upon him… It is his pleasure and purpose to help you with whatever you need whenever you need it. If you are feeling sad, or have low energy… call upon Michael. He will help you to remember your purpose, realign with passions, and live life more fully and vibrantly. Archangel Michael is the first angel I ever channeled… He came to me at a point in my life when I felt very alone, lost and discouraged. I wanted to change my life for the better but did not know where to begin. I prayed for help, and Archangel Michael answered with incredible love, encouragement, and clarity. Even now that I have learned to work and connect with many different angels, Michael still feels like one of the closest Angels to me, always coming in clearly with precise, loving and direct guidance. When I connect with Archangel Michael, his energy feels warm and loving to me. He has a fiery spirit and will greet you with unconditional love regardless of your current circumstances. Working with Archangel Michael has definitely changed my life for the better and I strongly encourage you to call upon Michael for protection, motivation, clarity, and courage to move in the direction of your dreams. Working with Michael is simple and easy! He will even help you to learn to connect with him if you are ready and you ask him for assistance. Simply take a moment to clear your mind… focus within and imagine that angelic light is all around you. Think or say “Archangel Michael please connect with me now… and let me know that you are with me”. Notice how you feel… and tune into your subtle senses. If you ask… your angels will always answer. Angels exist in a realm that is somewhat finer and lighter than our physical dimension… but you are definitely able to tune into the angelic realm and with practice and intention you can learn to clearly see, hear, sense and know the presence of Archangel Michael. Once you connect with Michael, let him know the situation you would like help with… but be open to how the help appears. Sometimes angelic help does come in the form of miraculous direct intervention. Other times angelic aid is more subtle; in the form of a recurring idea, a chance meeting, or even in the form of a feeling. Remember there is no formal education, training, or invocation needed to call on Michael or any angels. Just thinking about angels is enough to call them to you and elicit their angelic assistance. “Welcome friend. I am Archangel Michael and I offer you my protection now and always. At this time, allow your awareness to center, focus your awareness deep in the center your heart, and allow your heart to open. From within your open heart, you are able to connect with me fully. Allow this connection now. Yes, I am an archangel of protection. And I wish for you to know that by simply speaking my name, I am with you. This is true in your dream state, as well as your waking life. Think or say: “Archangel Michael” and you will call me forth. With your permission, I am happy to help energetically protect you now, and we will begin your protection with an energetic cleanse. I use my sword of light to cut any and all cords of attachment tying you to other people, events, situations or places that may be draining your energy. We cut the cords now, pull out the roots, and call upon the gentle elements of rain and wind to wash away any residue of negativity, of doubt, and of discord. Stagnant energy, fear and negativity are washed away now with the gentleness of the rain, and the light breeze of wind. Breathe, and release into the light. Now any and all energy that is rightfully yours, that has been drained by others consciously or unconsciously, returns to you in a golden spiral of light. Breathe, relax and sense this return of your light, vitality, and vibrant energy as it is now rewoven into your energetic fields. And now we call upon the white light of purity to surround you in a cocoon. This is a level of protection as well as a restoration of your life force energy. Feel your energy and awareness expand as you are embraced in this white light. And know that you are safe. For within your shield of white light and with my protection, all that is not love is immediately dissolved and released into the light upon approaching you. Feel the truth of this as you vibrate at the level of love. You are loved, and you are protected now. “Archangel Michael, protect me now“, are the only words you need know to invoke me. By speaking these words, know that I, Archangel Michael, am here with you. With my shield blocking = distractions, doubt and fear, and with my sword, I am able to cut any cords of negativity and cut out any obstacles that may lie upon your path. Understand dear one that in your highest authenticity, you are a being of light. As you remain focused inward, allow yourself to experience this truth now. Know that you have been cleansed, and that you are protected. Turn away from the voice and doubt of ego which tells you to be afraid, and look only at the truth that lies within your open heart. Look inward to experience the full connection with your Divine authenticity, with the love of the Divine and with the love and protection I flow your way and offer to you now. You are protected in a shield of white light surrounding your physical body, surrounding your emotional body, your mental body, and your auric body. At this time, we call upon three thousand angels of protection to be with you always, surrounding your mind, body and spirit. Know that you are safe from the core of your very being, for you are safe and protected and cleansed with unconditional love and joy and compassion. Stay in alignment with this you high vibrational energy signature, and you will radiate love, joy, and compassion outwards and create this experience in the world around you. Go now with this knowledge to seek your truth. Follow your inner calling that is there by following your joy, bliss and inspiration as you progress on your unique path of love. You are one with all, focus on serving all in a way that is inspiring for you, and you will draw blessings into your life and greatly benefit the greater realm of all that is. Be brave and be bold, and be willing to be an individual, step away from the need to fit in, or fit the molds of illusion that ultimately do not serve. Take action in alignment with the inspiration and guidance you receive and know that you are so loved and supported by the entire celestial realms. I am supporting you and guiding you and I am always a breath, and a simple thought and intention away. Free Channeled Messages with Archangel Michael! Below, you will find links to many more of the free angel messages I've channeled with Archangel Michael. It is my hope that they will help you to learn to connect with your angels directly for yourself, and align you with your Divine light and highest truth and authenticity. I hope you enjoy! Connect with the frequency transmission of Archangel Michael, the powerful energy of Divine white light, and your personal team of guides and angels in this beautifully uplifting and free 13 minute meditation. Want to quickly connect with Archangel Michael to raise your vibration, and shift your point of attraction? Then this short 3-minute meditation is perfect for you! Archangel Michael shares a profound message and frequency transmission in this session. He shares that not only are Love and Joy some of the most powerful energies of psychic protection, but that they also will guide and lead you right into alignment with your soul path and highest Divine purpose. In this session, Archangel Michael helps you to attune your energy, aura, and frequency which he calls “Your Personal Atmosphere” to Divine Love. Bringing your vibration into alignment with Divine love and your highest authenticity in this moment here and now. Grounding and centering your energy are essential for staying balanced and continuing to progress on your path of awakening. Although essential, they're often overlooked! In this message, you will learn how to quickly and easily ground and center your energy with direct guidance and assistance from Archangel Michael. Cleanse and elevate your vibration in this guided meditation channeled with Archangel Michael. Cleansing your energy is one of the best ways to reset, and realign with joy and vitality in your life. Connect with the message and uplifting frequency of Archangel Michael to reset your point of attraction and inspire creative, positive change in your life. Archangel Michael shares a powerful ascension technique that will benefit you, humanity and the entire earth… By grounding Divine light, and the crystalline light of ascension into Gaia, Mother Earth. In this session, Archangel Michael eloquently guides you to connect with the Crystalline Grid to receive the ascension frequencies and codes of awakening available to you. This process not only infuses your own life and being with Divine crystalline energy, but it allows you to step into powerful light work as you share the love with the human heart grid to uplift and benefit all. Archangel Michael connects with insight and direct light frequency to support you on your ascension path in these powerful times of accelerated awakening. As you read or listen you will not only learn logically, but experience a powerful transmission of ascension light and Divine love. Connect with Archangel Michael in this free meditation to realign with your souls highest authenticity so you can become aware of your highest purpose as a soul, and begin taking steps in alignment with your Divine soul purpose and mission. In this written angel message, Archangel Michael shares a simple process for deeply relaxing so you can connect with the realms of angels… Lift in the incredible angelic energy of peace, bliss, light and love to bring a newfound sense of harmony into all aspects of your life. Archangel Michael reconnects you with your inner spark of Divine light in this free meditation. As you listen you will rekindle your inner light, and realign with a newfound sense of light and vibrant energy in your life. Be the change you want to see in the world to create positive change in your life and far beyond… In this free meditation channeled with Archangel Michael you will be guided to do just that! In this free channeling with Archangel Michael you will learn how you can create quantum shifts and positive changes in your life by freeing yourself from the veil of illusion and stepping into infinite possibility now. Or you can purchase the Archangel Michael Meditations CD here! 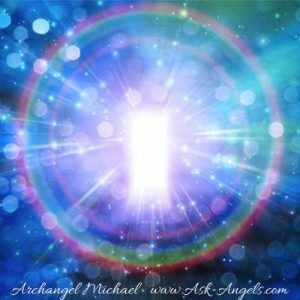 Connect with Archangel Michael to cleanse, clear, and lift your vibration in this lovely video angel message! Know that you have many angels and guides with you always. They are there waiting to help you, but they will never interfere in your life without your request. Learning to connect with your angels will allow you to ask your angels for help and to work with your angels to manifest the life of your dreams. Archangel Michael is powerfully supportive in helping you to have a direct experience with the healing, cleansing and loving vibrations of the Angelic Realm. Bringing light into your life in this way is called ascension, and Archangel Michael can help you with it! Are you ready to make the conscious choice to embody an enlightened perspective and to experience an ascended state of being? This Angel Course will help you to progress on your ascension path in to higher levels of love and light. This angel course is made up of seven messages from the Archangels to assist you in activating and opening your chakras, lifting your vibration, connecting with your Guardian Angel, and then lifting even higher to experience your Higher Self and the realm of Archangels. Tap into your Past Life Wisdom and Healing, Neutralize and Integrate Past Life Challenges, and Heal Past Life Karma in this powerful channeled angel course. This course is made up of four .MP3 audio components recorded with Archangel Metatron, Raziel, Michael, Haniel, and Orion. Elevate Your Vibration and Empower your Spiritual Gifts. Archangel Michael, Archangel Uriel, Orion, and the Council of Light connect in this Angel Course, which is complete with powerful guidance, and a healing, uplifting frequency to help you step into embodying more of your spiritual light, accelerating your spiritual growth, and revealing your spiritual gifts and abilities. I met Michael in a coma. I am not a religious person and knew nothing about him. I have no fear of death now and many other gifts I have noticed in almost eight years from my NDE. He is still around too. Some things we just know. Michael is with me. I get a human form of him as my own. he helps everyone but he is with me. He just wants to dirt bike. I know it sounds crazy and he loves helping people but right now he wants to be human. For some reason he turns away from the idea that he has a greater purpose but he knows deep down. He saved me, I love him more than anybody. He’s the most handsome man I’ve ever seen. He is my soulmate though he doesn’t have one I don’t think. believe it or not I am an old wise soul. I am also reptilian in ancestry. I have broken the evil ways thanks to Michael. And I pray he does not leave me now that I understand. weird enough to say I feel he needs me as much as I need him. He just wants a dirt bike and to love and be here as human. We are all of One consciousness. I feel we need to get away from electricity because it will hold us here. The evil ones want our souls and us to feel as we are individuals but we are at one. I believe that I was on my last life. I died and saw there was nothing this just White. I panicked more than I could ever explain. The human form of Michael was there as this happened and he felt it. I woke up after saying I’m dying in my sleep. he was already very aware of what was going on. He was shaking. and that’s when I realized I was going to be nothing soon. Not even a thought. Then recently it came to me and my higher purpose and Mission I believe is to spread the word. We Are All One and we need to be positive. I finally have it figured out and now I believe I won’t be nothing when I die. Again I know all this sounds crazy but I can tell you I know it’s true I don’t know for sure what my mission is yet once I figure it out you will all know and Michael will help me. I really Love every guidian and strong prayer meeting over me to change my life entirely but i have never inspired anything and how do i expirence this earlier, is it by dream or revelling me. Hi there, I was wondering if Archangel Michael or anyone really could shed some light on this question I have? A few nights ago I was contacted by an angel in my dreams called Samael(an angel brandishing two flaming swords), I researched the name and found he was actually compared to Lucifer and viewed as a satan type character although other websites claim this angel simply gets a bad wrap because he’s connected with Mars and the more intense zodiac signs Aries and Scorpio. Basically this angel offered to be one of my guides in my dream and help me unlock my power but I’m unsure on whether I should trust him or not as Doreen Virtue a well-renowned medium and angel therapist claimed he embodied more destructive forces. Typically I would just ignore this angel but so many things about him sync up with my spiritual makeup, “he represents the signs of Aries and Scorpio-I’m a sun in Aries in the eighth house(the house of Scorpio) giving me qualities of the sign, one of the animals he represents is the Owl(my spirit animal) and I’ve never been contacted by an archangel before and I don’t want to pass up something that could be a great opportunity. If any of you have some advice on the matter that would be great if not I understand. Thank you. You may test any spiritual being by asking where it’s allegiance lies, if the answer is Jesus, he is from the Light. Ask the being who he works for, before anything else! No angel of light works without God’s will. How can I hear or speak with my Angel and for my angel to be powerful in my life? I’ve felt his presence around me a lot the last few years, even though I haven’t had the courage to fully channel or invoke him yet. First were the feathers, then the numbers, and I can usually feel his energy around me when I get nervous, upset, angry, or negative. At times, it feels like he’s transferring his energy into my spirit, which feels very heavy (in a good/ indifferent way) when he needs me to be calm. This process usually feels like he enjoys circular energy, in order to fully wrap his powers around you. I don’t even want to go into the physical vibrations. I know he’s definitely present when he sends recurring thoughts of,”Stop it, help is coming,” to block out my negativity. I’m glad you have had experiences with him. He is definitely a powerful guardian/ ally to have by you. As soon as I began to read the Michael Prayer aloud, I began to get emotional to the point of crying. That told me that He was there with me. I could almost see him in the room with me. I could feel his wings around me. I haven’t felt that safe and warm and good in a long time. Then I did the cleansing and clearing guided meditation and it was more of the same. I know now that Michael is my special angel. WOW! So glad to hear this Dennis… Thanks for commenting! Well I don’t know you but all I can say is keep up the good work. you can do do this, no need to feel pityfull for ourselves. Nothing will happen or manifest that way well yes only low Energies and negative things will happen. Yesterday my mother in law was going through some papers and came across a photo of the arc angel michael she gets from the church. I asked if i could have it. I then took my holy water i have in a angel decanter put a cross on the front and back. Then put in the visor of my car. That night my son used the car came home said some guy ran a red light but he hesitated to go through his green light. I told him to go look in the car and you will know why you hesitated. He came back in with a big smile on his face and said thank you jesus!!!! What a great story! Thanks for sharing Victoria! 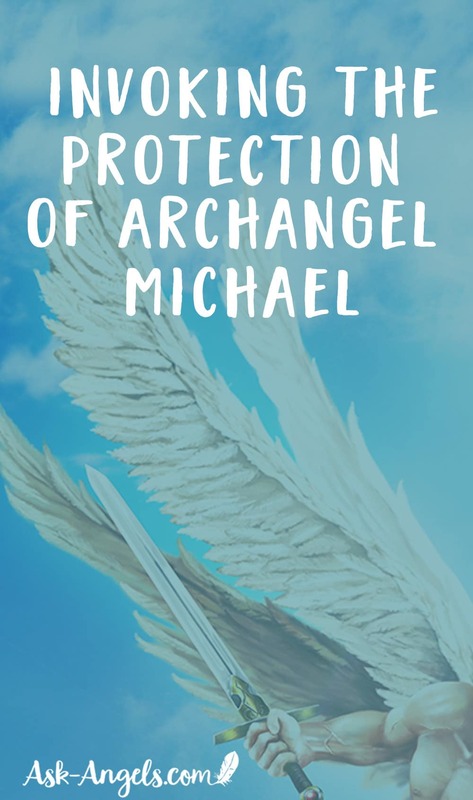 I don’t feel all mushy gushy when I connect with Archangel Michael, but he did protect me from an evil, negative energy that bombards me everyday! I loved reading this. I recently started praying to St. Michael due to a personal life crisis. This was one of deep hurt and concern and I was at my wits end. The other night, I had a dream (more nightmare) and there 3 evil people in it. I was scared. So I asked for his help. I felt a light and could feel a box surrounding me. There was comfort. And the evil characters in my dreams disappeared as I asked 3 times for him to protect me. I realize now that the number 3 is very symbolic as St. Michael is mentioned in 3 different scriptures. The Bible, Torah and Quran. All I can say is thank you. I’m not a religious person but something happened here that I cannot explain. He is my guardian angel and I know he’s with me. Has changed everything. I was very overwhelmed as i called on archangel Micheal it waa an amazing feeling and very grateful to have found this site im using it as much as i can. Thank you so much. You please connect with an angels on behalf of and tell them for helping me. Hi Melanie, I would like to know SPECIFICALLY how Archangel Michael helped YOU, when you felt alone, lost and discouraged. You wanted to change your life for the better, and you stated this was your first time channeling him, sooooo, how did he come to you, how did he help you??? Thank you. That first time I connected with Archangel Michael, it was as if an incredible peace and light suddenly washed over me. I felt calm, and reassured… which was further strengthened by the message I received from Michael that everything was going to be OK and I was embarking on a new path of awakening and development with so many blessings in store. After that first meeting it was like I had been illuminated and a weight had been lifted. I dove full force into reading and learning about spiritual development, ascension, and channeling to learn how to increase my connection with Archangel Michael and the angelic realm further as it was so lovely… and I wanted more. A few years ago, I took a course learning how to call upon seven ArchAngels. that I learned about are wonderful too.